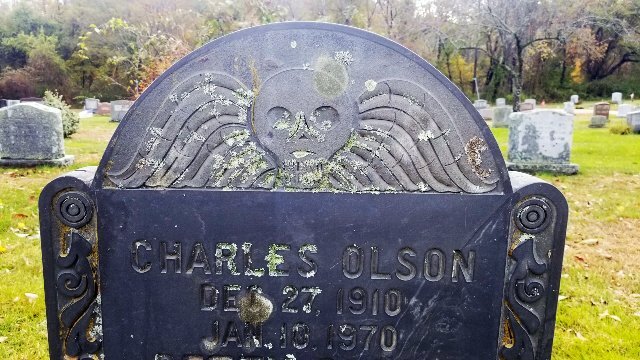 Charles Olson's Headstone in a 17th century design. All photos by Pippy Giuliano. 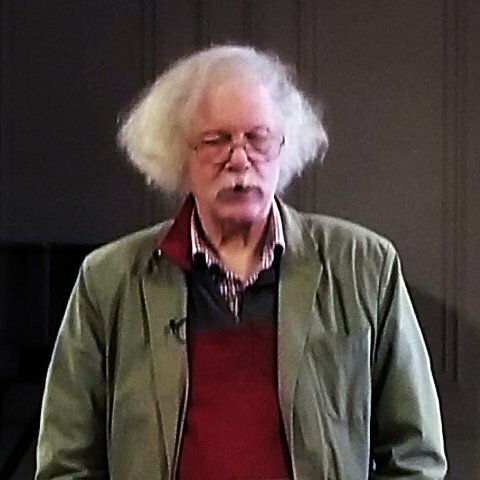 Poet and former leader of The Fugs, Ed Sanders, delivering the annual Charles Olson lecture. 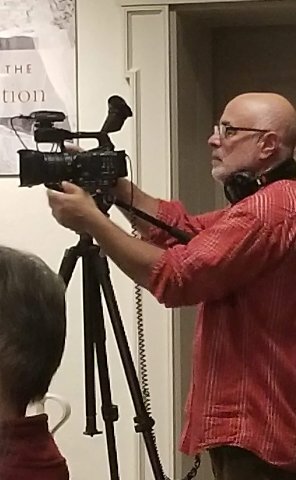 Henry Ferrini documenting the Sanders lecture. Susan Erony ehibition at Trident Gallery. A tree reveals its roots. Deconstructin an Homage to a Square. Ed Sanders delivered the ninth annual Charles Olson Lecture at the Cape Ann Museum this weekend to a packed crowd. He held us spellbound for an hour and a half punctuating his delivery of Olson’s life and works with more than seventy slides of Egyptian hieroglyphs, mystical symbols, memorabilia and excerpts of Olson’s writing. Sanders swept us along his narrative of Olson and his merry band of characters, of psilocybin romps through Dogtown, swigs of Cutty Sark in the kitchen at 28 Fort Sq. and dancing with Merce Cunninham at legendary Black Mountain College. It was a real strange trip video recorded by Henry Ferrini. Most likely, it will be posted on the Gloucester Writers Center web page https://gloucesterwriters.org/ . Scrap Netflix and carve out some time to enlighten yourself and enjoy the Sanders presentation. While you are digging around the Gloucester Writers Center page, take note of Speaking of Olson: Kate Colby, Amanda Cook and Kate Tarlow Morgan on November 10th at the GWC. Essays, poetry reading and personal works will be shared. The Olson flame continues to burn brightly. BTW, while embarking on a pilgrimage to Beechwood Cemetery, I found Olson’s modest slate marker on Cherry Rd. about 2/3rds the way up the row on the east side. 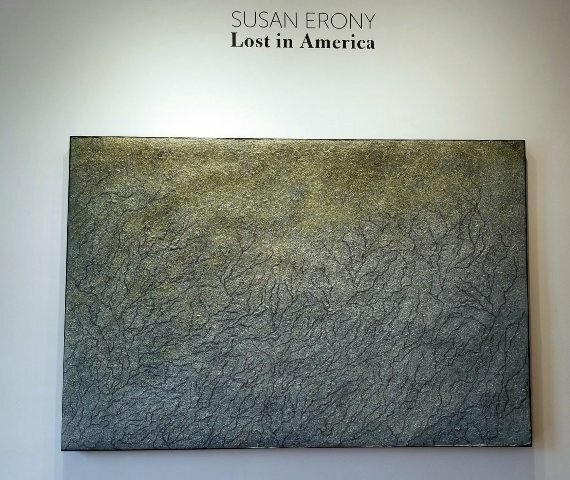 In her solo show, Erony presents all new works in mixed-media. The work is somber maybe even bleak – baring witness to past and present. The work compels us to examine and confront philosophical and social issues. My Father was a Refugee reminds us of America as the promise of a better life and of the current uncertainty facing us as individuals and a nation. In Gertrude and Me Erony’s eyes stare back prompting us to remember all that we have lost and stand to lose. 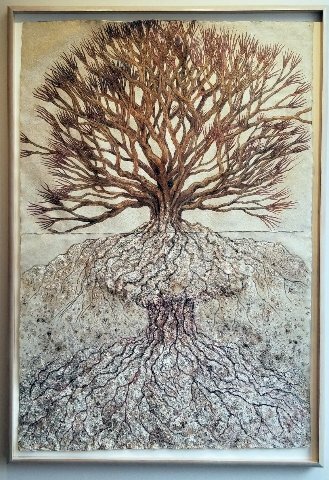 Growth the pencil and acrylic image of the tree seen from above and from below gives hope that nature is resilient. It is an ancient symbol, (The Tree of Life https://www.tolols.org/ ) that persists through the ages in spite of human ignorance and cruelty. 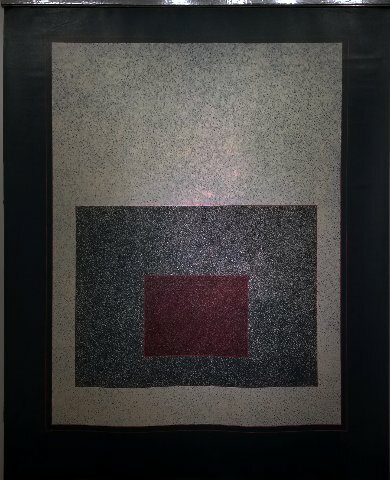 Erony will give a talk at the gallery on November 10, 2018 at 1pm. She is the current artist in residence at the Gloucester Writers Center. 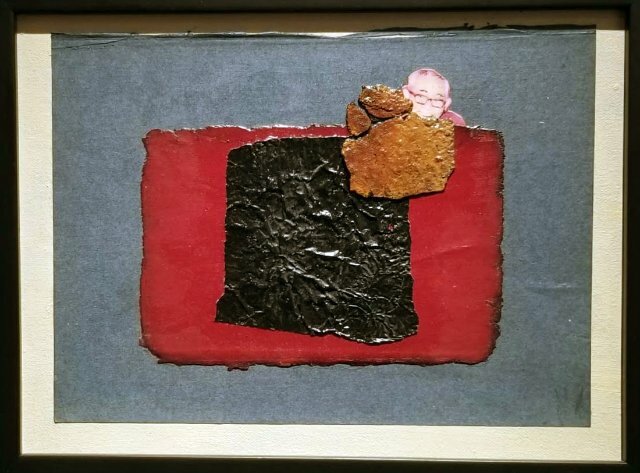 The Cape Ann Museum http://www.capeannmuseum.org in partnership with Gallery A4 of the Tankenaka Corporation, Tokyo mounted an exhibition this summer to mark the 75th anniversary of the publication of Virginia Lee Burton’s classic children’s book, The Little House. The exhibition honors the work of Virginia Lee Burton (1909-1968) as author, illustrator and founder of the Folly Cove Designers. The anxiously awaited scale model of the little house fabricated in Japan has arrived at CAM via freighter, through the Panama Canal to the port of Gloucester for the exhibition opening, Saturday November 3, 2018. It is a treat for children of all ages. The Caldecott Medal winner, The Little House translated into Japanese in 1954 has universal appeal. It is the story of a charming house gobbled up by urban expansion. Just before succumbing, the little house is once again appreciated and transported back into a pastoral environment. The story confirms the essential aspect of a spiritual and restorative connection with nature so vital to our existence. Shinrin-yoku www.shinrin-yoku.org/shinrin-yoku.html or forest bathing is a well-known curative Japanese practice. The Little House: Her Story will continue through March 31, 2019 with programming and events. So, come to the museum, take a walk in nature and most importantly, read to children. Life imitating art: Virginia Lee Burton’s writing cottage was moved from its original foundation to the grounds of the Lanesville Community Center, 8 Vulcan St. The permanent installation will be open to ”Jinnee’s” fans and admirers. Which reminds me of the exquisite documentary film that illustrates Burton’s life and art, A Sense of Place, produced by Gloucester resident, Christine Lundberg of Red Dory Productions. http://www.virginialeeburtonthefilm.com/film/ The video is available at the Cape Ann Museum and can be ordered through your local bookstore. "Olson thought as a place Gloucester had cosmic depth.It inspired Eliot who summered there on Eastern Point to entitle one of his four quartets: FOUR QUARTETS T.S. Eliot THE DRY SALVAGES (No. 3 of 'Four Quartets') (The Dry Salvages—presumably les trois sauvages—is a small group of rocks, with a beacon, off the N.E. coast of Cape Ann, Massachusetts. Salvages is pronounced to rhyme with assuages. Groaner: a whistling buoy.) I"
"Wonderful report Pippy- thanks for keeping me updated!" "What a lively and engaging summary about the Charles Olson Lecture! I can't wait to see the scale model of The Little House at the Cape Ann Museum. And I so appreciate all the other links given to happenings in Gloucester!" "Once again I enjoyed keeping up with the arts with Pippy, and her lively, breezy Cape survey. This reader wonders, however, how many thereabouts, or anywhere, read and understand Olson. Nor do I recall mention of his mentor, Ezra Pound-- a good beginning study for anyone so interested, or obsessed. Also, are there young poets and writers on the Cape?"